This 16' x 32' Basement Synthetic Ice Rink features our 3/8" High Performance Synthetic Ice and Tall (42") Boards. The customer added decals and plexi glass to enhance the look and feel of their rink. This 20' x 40' Synthetic Ice Rink is enjoyed year round. 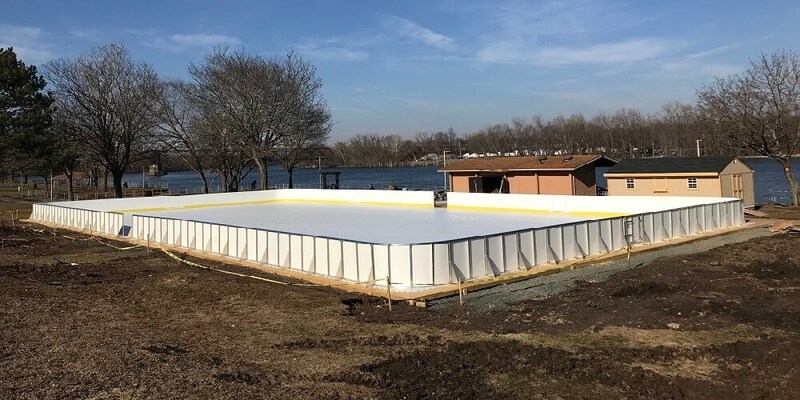 It features our 3/8" High Performance Synthetic Ice and Tall (42") Boards on the 20' Ends and our Short (24") Boards along the 40' Sides. The rink withstands the extreme heat and sun during the day and the cold nights in the Phoenix desert. 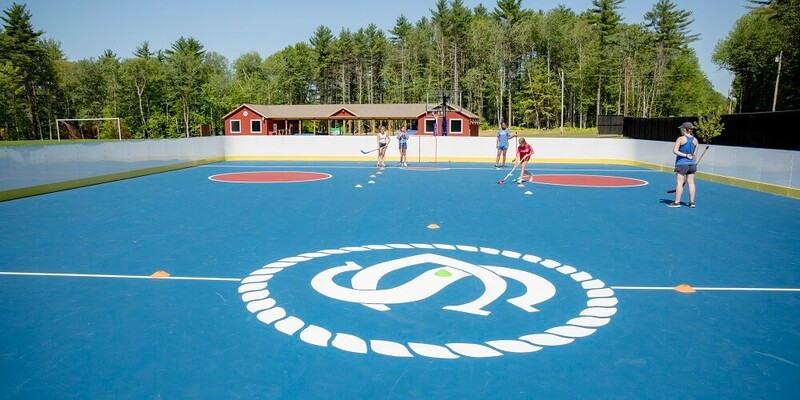 This 37' x 55' rink wrapped around a game court features our Short (24") Boards with 4 Rounded Corners. 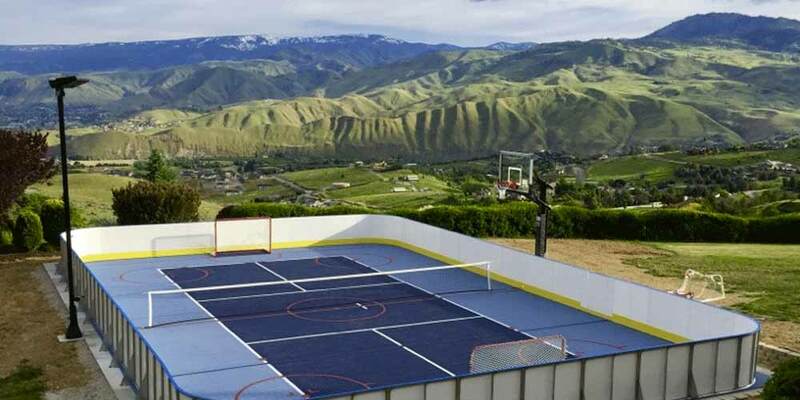 This rink is used year round. During the cold weather months, the customer floods over the game court and skates on natural ice. D1 Anchor Plates were used to achieve the permanent installation the customer desired. This garage rink features our D1 High Performance Synthetic Ice, along with our Tall (42") Boards, including 4 Rounded Corners and 1 Gate. 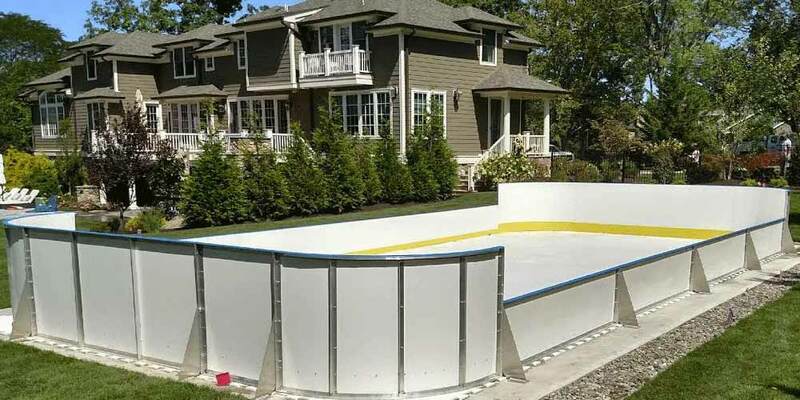 To maximize their rink area, the customer planned for the goals to sit flush with the boards. To protect the walls above the boards, our WHITE Dasher material was installed above the BLUE caprail. The decals were added as a nice final touch. This rink consists of 21 boards. Because this was an indoor rink with very specific measurements, we shipped 17 of the boards on the initial (1st) shipment. After the customer installed the first 17 boards, they measured the remaining 4 boards for us to make up and we made them within a few days and sent them out. Installation was completed over a weekend with the help from a few hockey Dads. 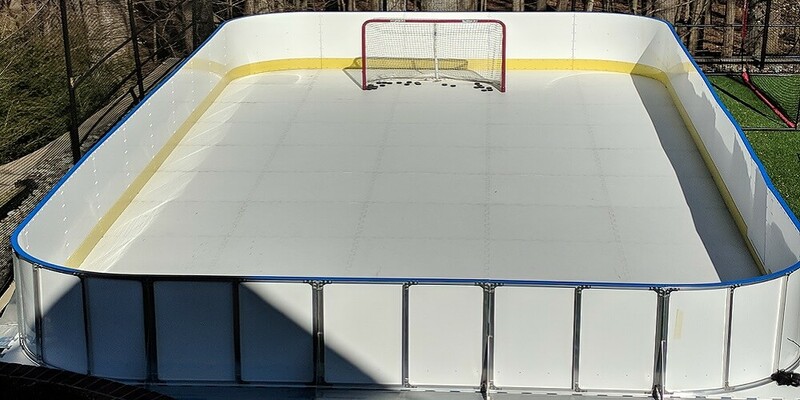 This 16' x 16' Garage Rink features our 3/8" High Performance Synthetic Ice and 3-sides of our Tall (42") Boards with 2 Rounded Corners. Half of the hockey rink boards have been mounted flush to the garage wall. The other freestanding half utilizes our Base Kicker Board Support, which uses weight to support the Boards avoiding the need to drill into the garage floor surface. In conjunction with Sport Court of New England, this game court is wrapped with our Tall (42") Boards, 4 Corners and several Gates. The customer has the option to flood over their game court using the D1 Winter Rink Components. Our Anchor Plates were used to support the boards for this permanent installation. 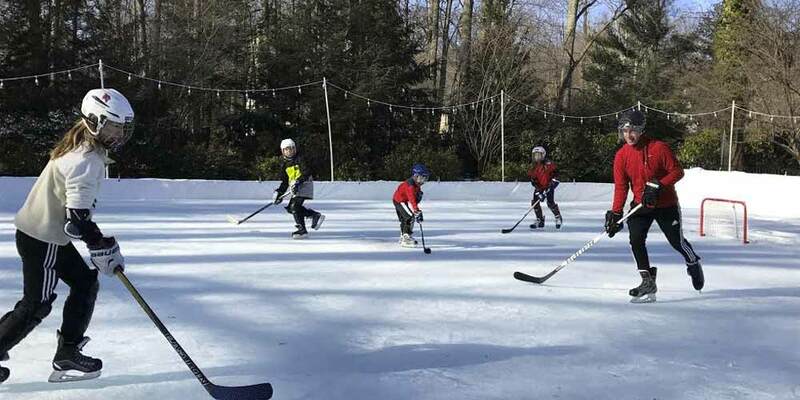 This traditional winter rink in North Attleboro, MA was made larger after its first season. This demonstrates how easy it is to expand your D1 Rink over time. Start small if you like and grow with your D1 rink as your kids get bigger. This rink is in an attractive setting that features our Hockey Rink Boards around a game court system. The customer chose our Combo Hockey Board configuration running our Tall (42") Boards and Rounded Corners along their 40' Ends and our Short (24") Boards up their 80' Sides. A combination of our Anchor Plates and Base Kickers were used to support the boards, as the site had various sub surfaces that needed certain accommodations. This is a 20' x 40' Synthetic Ice Rink features our 10' Tall rink netting for upper containment. The netting is tied to the vertical posts that easily fasten to the back side of the boards. Do You Have What It Takes To Go D1? D1 manufacturers hockey rink products including Hockey Boards & Synthetic Ice. We are great at building hockey boards and offer the best synthetic ice on the market. 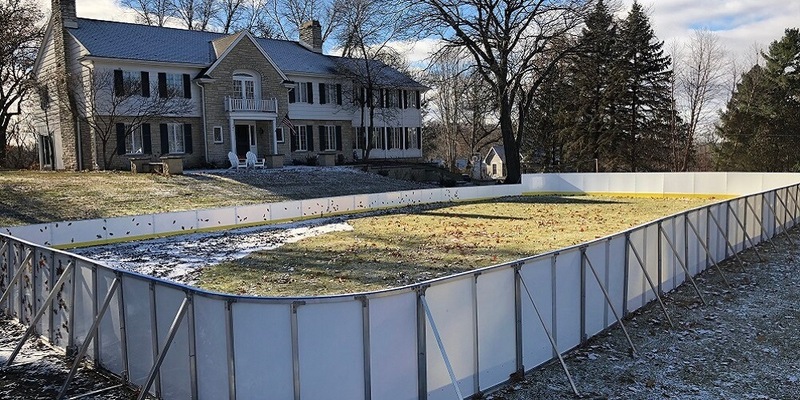 All synthetic ice rinks and hockey boards are handmade by D1 Backyard Rinks in St. Paul, Minnesota, U.S.A.
Our aluminum hockey boards are great when used as indoor hockey boards, as a backyard ice rink kit or with any fake ice rink. 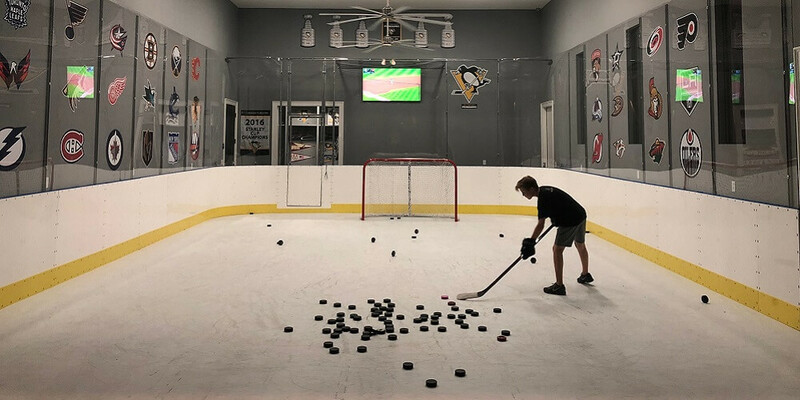 If you want synthetic ice at home, you can easily setup hockey boards for basement and create a basement hockey shooting area and combine it with synthetic ice tiles to make a synthetic ice skating rink. In addition to backyard hockey rink boards for sale, we also offer pond hockey boards. The dasher boards will make a great backyard hockey rink or artificial ice rink. D1 synthetic ice for sale will create a world class artificial ice surface. You will absolutely love your synthetic ice skating experience. Before building a synthetic ice rink, we encourage you to complete a synthetic ice comparison with our synthetic ice tiles and other brands. There are several pros and cons of synthetic ice that you will want to consider. We offer step by step instructions on how to make a synthetic ice arena and install your hockey boards for home. D1 ships its synthetic ice tiles and hockey arena boards throughout the United States and Canada. The hockey boards cost cost varies based on size and the hockey boards height. The synthetic ice rink cost will vary based on rink size and the thickness of the synthetic ice tiles. We have several financing programs available to help with your purchase including 0% Interest, Same As Cash & Interest Only programs. Please call us at 855-355-3131 to learn more.